Nov. 23, 2017, 9:29 p.m.
who has them, who likes them, who's demo'd them and is thinking about getting one. which do you like and why. what are the drawbacks even for those you like. i demo'd a Marin Wolf Ridge in late summer. i wanted to like it, my buddy sure does (waiting for his to arrive) but i didn't. i'm sensitive to seat angle and reach and really adjusted to a certain fit, and this one was much different. yes there was some pixie dust with the pedalling platform as advertised but i just didn't jive with it. last weekend in the monsoons, i demo'd a Norco Range 29. impressive all around. definitely sleepy and wandery on an xc ride but with enough tech thrown in for good measure it was still fun. incredible climbing traction, cleaned all the tough bits on my route. made for serious high speed descending with stunning stability and plush rear traction. i'd still prefer a bit steeper STA (xl bike) but it was manageable and probably perfect for many guys. i'm keen to get on any one that i can at this point. Wreck, Sent, E29, all of them and see how they differ. very cool bikes. Nov. 23, 2017, 9:33 p.m.
Nov. 24, 2017, 5:51 a.m.
Nov. 24, 2017, 7:06 a.m.
Last edited by: XXX_er on Nov. 24, 2017, 8:46 a.m., edited 1 time in total. Nov. 24, 2017, 9:23 a.m.
Just ordered an XL Orbea Rallon 29 after a demo ride, to complement my XL Smuggler for alpine/resort/gnar riding. The orbea has an even steeper effective sta compared to the Smuggler, lot more travel and slacker hta, but the same reach. Felt awesome on the shortish demo ride. The smuggler can do a lot, only area I really would like more cush is for bigger jumps and long alpine trails. Just for the added comfort, my wrists are acting up now and then. Only real downside I’ve came across: you need some really, really demanding trails to not feel overbiked. Or to fit some quick rear tire, to add some sketch. For tall people they are a revelation though. I don’t have trouble navigating really tight stuff, as the added confidence because of a great body position and added traction enables me to lean the bike more. In fact I seem to clear a lot of tight and steep stuff easier compared to the smaller bikes I’ve owned before. Nov. 24, 2017, 9:26 a.m.
Kona has the new Process 153 29er as well now .I chatted with Spence at VMB . He recently spent some time on the new design .And stated it is a way better climber and all around bike when compared to the 153 27.5 . I have been offered a killer deal on a Process 29er frame set . So I am debating on building a bigger travel 29er to replace my soon to be forsale Kona167 , that,s been replaced by my Django 29er :). Oh and I second what XXX_er stated about the 36 and switching to the 29" wheels. Last edited by: DemonMike on Nov. 24, 2017, 9:28 a.m., edited 1 time in total. Nov. 24, 2017, 2:17 p.m. I don't want to derail the thread, but I have a related question: At what height does the big wheels begin to be a problem for shorter riders? I am 170cm (about 5'7") and I have only ridden 20" and 26" wheels in my life. The new Instinct BC ticks pretty much all the boxes for me, but I am afraid I may be a bit short. Anybody has an idea on this? Thanks! Last edited by: FlipSide on Nov. 24, 2017, 2:17 p.m., edited 1 time in total. Nov. 24, 2017, 5:26 p.m. SO obviously if you are short you don't deserve to live. Nov. 24, 2017, 6:08 p.m.
i don't think there's a clear delineation regarding size and 29ers but i would think they start making more sense around 5 10 and up. however, one of the local supershredders races a R29 and he's an inch shorter than you. he is very strong and can muscle any bike around. he did say that since his inseam is only 29" it can be a bit of an issue when getting off the back of the bike. he buzzes his junk a lot apparently. Nov. 24, 2017, 7:03 p.m.
Nov. 24, 2017, 11:09 p.m.
Nov. 27, 2017, 1:42 p.m.
Dec. 10, 2017, 8:55 p.m.
Dec. 11, 2017, 8:53 a.m. 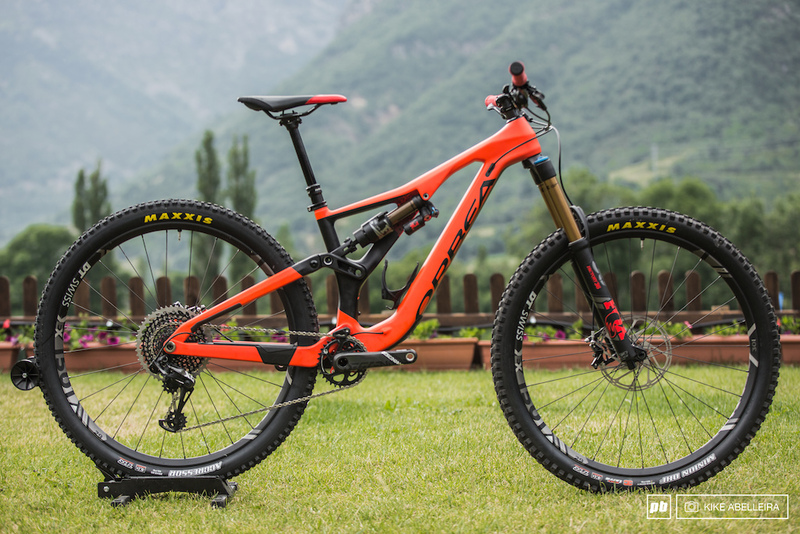 The Scott and Whyte above have my interest piqued...as well as the Transition Sentinal, Wolf Ridge and the Orbea Rallon and the new Knolly (even if it is not a LT). Would love to throw a leg over them. I have been riding my Banshee Prime for about 4 years now, great friggin bike with nothing wrong with it...just feeling the pull towards the new super bikes. **All measurements are for the largest size bike...usually in the steep setting. Last edited by: pedalhound on Dec. 11, 2017, 1:02 p.m., edited 3 times in total. Dec. 11, 2017, 11:53 a.m.
that Whyte looks amazing. i prefer the lines of the alloy one even more. can be had through Whyte USA at great cost and hassle. the Orbea seems like a real uber bike based on the few reviews. have you tried their colour selector? basically you could end up with a totally one of a kind bike. stunning rig for sure.